Looking for a new cheesecake fusion? This perfectly spiced carrot cake cheesecake combination is out of this world yummy! You will need to save this cake now because it’s a perfect cake for Thanksgiving and Easter or any other occasion. Speaking of occasions, today is my husband’s birthday. Happy Birthday, honey! His favorite cake is carrot cake and he likes cheesecakes too, but you know how I feel about cheesecakes. I mean, this cake has our names written all over. But, there was a problem. 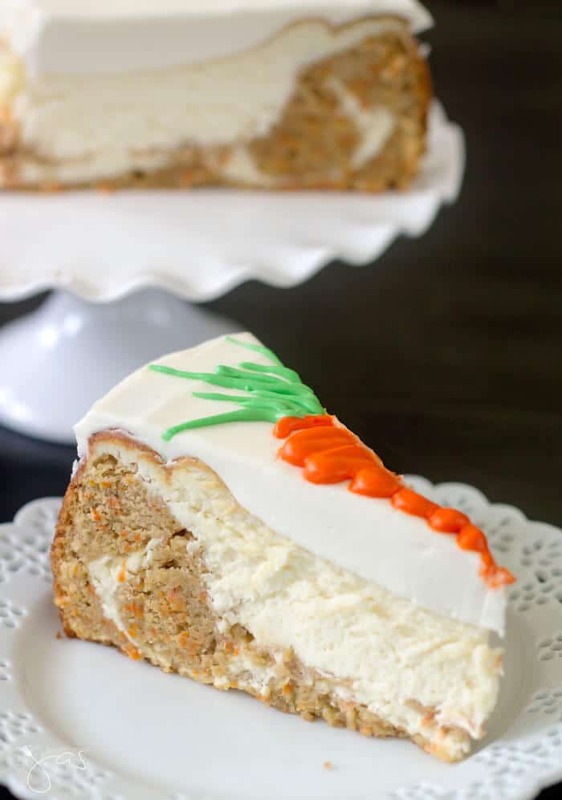 You guys, I need to redo this carrot cake cheesecake asap! Yesterday, I was just getting ready to store hide the cake in our downstairs refrigerator after it had cooled, when my husband walked into the house. He came from work early and wasn’t supposed to see the cake until today. I panicked and put the cake in the, still somewhat warm, oven. With no time left for a do-over, we’ll celebrate my husband’s big day with this thin carrot cheesecake and I’ll make him another one soon. Although it’s looking less than perfect, I still wanted to share the recipe with you because now that you know NOT to stick it into a warm oven, you’ll have no problems making it perfect! Shredding carrots in a food processor with a grater blade will cut down on prep time. Cut them down into chunks first. Keep in mind that each oven can vary in temperature so watch closely as it gets to the 60 – minute mark. The top center part of the cheesecake should still be slightly soft and jiggly when you take it out. The cheesecake will puff in the oven thanks to the leavening in the carrot cake and it might even crack. It will settle after it cools and will be covered with frosting so the cracks won’t matter. Decorate the cake with chopped pecans or walnuts or with frosting carrots: Set aside 2 tablespoons of frosting and add orange and green food coloring to each tablespoon. Put each color in a small plastic bag (fold-over sandwich bags work great and are less expensive than piping/pastry bags). Snip a small piece off the corner of the bag with scissors and pipe your decorations on the cake. In a large bowl using an electric mixer, beat together the oil, applesauce, sugar, and brown sugar until smooth. Add the vanilla and eggs and beat until the mixture is creamy and light. Stir in the flour, baking powder, nutmeg, cinnamon, and salt until just combined. Mix in the carrots. Tap the bowl forcefully against the counter a few times to release large air pockets. In a medium bowl using an electric mixer on high speed, beat the cream cheese, flour, and sugar until smooth. Add eggs, one at a time, mixing just until combined. Add the vanilla and sour cream and mix until blended. Do not overbeat. Tap the bowl forcefully against the counter about 30 times to release air bubbles. Beat together the cream cheese and butter until creamy and smooth. Mix in the powdered sugar a little at a time until the frosting is well-combined with no lumps. Add the vanilla and sour cream and mix well. Pour half of the carrot cake batter into prepared pan and spread into an even layer. Dollop half of the cheesecake layer on top in large spoonfuls. Don’t spread or swirl. Dollop the rest of the carrot cake batter on and around the cheesecake batter. Don’t spread or swirl. Spread the remainder of the cheesecake on top into an even layer with an offset spatula. Tap the pan on the counter a couple of times to get rid of any air bubbles. Place the pan on a cookie sheet to catch any drippings and bake for 60-70 minutes. If browning is going too quickly, tent the top of the cake with aluminum foil. Let the cheesecake cool completely on a wire rack in the pan for about an hour. Cover with foil and chill in refrigerator at least 6 hours or overnight. Spread the frosting evenly over cheesecake then chill cheesecake in a freezer for 20 – 30 minutes. Decorate as desired. Cut into slices. Store in refrigerator in an airtight container. This delicious cake is made by combining two favorites: a carrot cake and a cheesecake. Why settle when you can have both? Dollop half of the cheesecake layer on top in large spoonfuls. Don't spread or swirl. Dollop the rest of the carrot cake batter on and around the cheesecake batter. Don't spread or swirl. Place the pan on a cookie sheet to catch any dripping and bake for 60-70 minutes. If browning is going too quickly, tent the top of the cake with aluminum foil. 10. Cover with foil and chill in refrigerator at least 6 hours or overnight. 11. Spread the frosting evenly over cheesecake then chill cheesecake in a freezer for 20 - 30 minutes. 12. Decorate as desired. Cut into slices. Store in refrigerator in an airtight container. Keep in mind that each oven can vary in temperature so watch closely as it gets to the 60-minute mark. The top center part of the cheesecake should still be slightly soft and jiggly when you take it out. Featured on: Reasons To Skip Housework, Life Sew Savory, Southern Beauty Guide, Apron Strings & Other Things, The Boondocks Blog, and Keeping It Simple. Carrot Cake Cheesecake take two. Sorry about your deflated cake. It’s annoying when that happens! But your hubby is lucky is get another one just because the first didn’t turn out like you wanted to. Man…you have patience doing all that carrots on top I would HV given up after the 5th! You know what the celebrity chefs always say… ‘Taste is king’! Hope your Dad is okay Jas. Even deflated it looks delicious! It’s so frustrating when things go wrong, I hope your husband enjoyed his day! It still looks delicious and I’m sure you all enjoyed it, plus you have a funny story to tell about his birthday cake! Pinning. I hope your Dad is okay. I can well understand your situation. I had been in a similar one. I know how annoying it can get. But your husband is lucky! He gets to eat another one of this yummy cake. I love how you made those tiny carrots on top. It looks really cute. Hope your dad is well and good! Don’t you just hate it when you set your heart on something and it doesn’t turn out? Oh well…my husband is already asking when the take two will happen, lol. Oh wow, this is my hubby’s two favorite desserts in one so I’ll definitely be making it! Still looks delicious especially with those adorable carrots! It looks delicious and I’m glad you decided to eat it anyway. I hope your husband had a great birthday and thanks for linking up with us again this week. Oh, we ate it alright! The taste hasn’t changed even though it was dense and not pretty, lol. Combining two of my favorites; cheesecake and carrot cake! YUM. Another cheesecake lover! YAY! Thanks for stopping in. Thanks, Teresa! We ate it to the last crumb, lol. Oh, my God, this carrot cake looks so yummy. I baked a carrot cake last year and did basket weave decoration on it and of course, my carrots were not at all cute like yours. Jas, you have a great blog. Found you on #ticklemytastebuds :). I am a new blogger who just started blogging last week. I am so happy to share my cupcake decoration and it’s my 2nd blog post. Please visit my blog and give me a feedback. Thanks and I am looking forward to reading your blog posts. Hi, Mnaisha! Thank you for your kind words. I’m sure your basket weave decoration was intricate and looked amazing! This cheesecake looks delicious. I love the little carrots, it is so cute and to pretty to eat, But I wouldn’t turn down a piece. Neither did I, Debra. LOL. Thank you for visiting! Hope your week is going great. Well, you KNOW I had to hop over from #EncouragingHeart&Home to find out about the “that almost wasn’t” part of your post! 😉 What a great story. And in spite of the slight mishap, this looks amazing. I love the use of applesauce in your carrot cake, because I personally do not want any pineapple interfering with things. Thank you for sharing this, and happy Thanksgiving to you! Thank you, Cindy! Delicious-yes! Pretty-meh. 🙂 Hope your turns out better!! Happy Thanksgiving! Awww! What a sad story! But at least it still tasted good. I’m looking forward to seeing a non-deflated version at some point, too. Happy belated birthday to your husband and thanks so much for sharing at the #happynowlinkup! Hopefully soon! Thaks for the bday wishes. Mwah! I thought I had my desserts for Thanksgiving all picked out but now I am not sure! I really want to try this. I think it would go great with the other ones I am making. Thanks for the recipe! Wow, this looks and sounds so very good! I wish that I could eat some right now! The little carrots on the top are cute! Your Carrot Cake Cheesecake will be delicious, wish I had a slice right now. Thanks so much for sharing with us at Full Plate Thursday. Come to next weeks Thanksgiving party on Tuesday at 8:00 am, CST, see you then! Oh my – at least it was not a dessert for a dinner party. Husbands will eat anything as long as it tastes good. Thanks for sharing with Fiesta Friday. Despite everything, the cheese cake looks beautiful. I love the little carrots on top. Bet it was delicious. Happy Birthday to your husband and thank you for bringing this to FF. Aw, thank you! It was a bit dense but delicious nonetheless. Hi Jas! This cakes looks amazing and I just love the way you have decorated with carrots. Thanks for sharing with us at #BloggersPitStop and have a great weekend. I love carrot cake, but I have never had a combination with cheesecake. I’m sure it is delicious! Thanks for sharing with SYC. Happy birthday Jas’s honey, hope you had a lovely day, flat, yummy cheese cake and all. Thank you, my dear Michelle! Jas, I know it was good, even if it did “melt” a little. It looks so good, I’m going to put it on my list of things to try. My hubby loves carrot cake too. Thanks, Carrie, will do! Hope you have a nice Thanksgiving too! Jas everyone loves this cake, not just me and so it was picked as most favorite over at Sweet Inspiration. Those little carrots are adorable. Sooooooooo pretty! Looks yummy! Thanks for sharing at Friday Frenzy Link Party! PINNED! Thank you so much and thanks for stopping in!